Omnivore now has an easy-to-use level editor for Jumpman! To mark the occasion, Kevin and I are holding a Jumpman level design contest. We invite you to create your new Jumpman levels and submit them to us. We will pick the best 32 levels and use them to create an entirely new edition of Jumpman! You may submit entries privately by emailing the .ATR file to jumpmancontest@gmail.com, or publicly by posting them in this thread. The deadline for entries is midnight UTC, October 22, 2016. By submitting an entry, you agree to put your level in the public domain. There will be two categories of entries: levels without custom code (created using only the Omnivore level editor, no programming skillz required); and with custom code (which requires some 6502 assembly programming.) You can create your levels either way. To get started, you’ll need to download the latest version of Omnivore and read the quick-start guide for the level editor. You’ll also want to watch Kevin’s video showing how to use Omnivore to make a level. 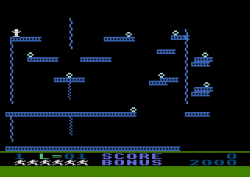 Optionally, you may also want to read our lengthy Jumpman Reverse Engineering Notes. Custom coders will probably need to, but it’s not needed for everyone else. Kevin and I really love Jumpman, and are thrilled to be able to provide a tool for creating new levels. We look forward to your feedback, and will do what we can to help you create new levels. I'm so exited by this! For inspiration, here's a new level I created. It's kind of a hard one. Awesome . 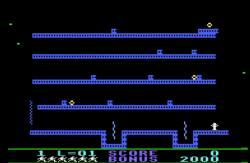 we need someting like the C64 Fire level. 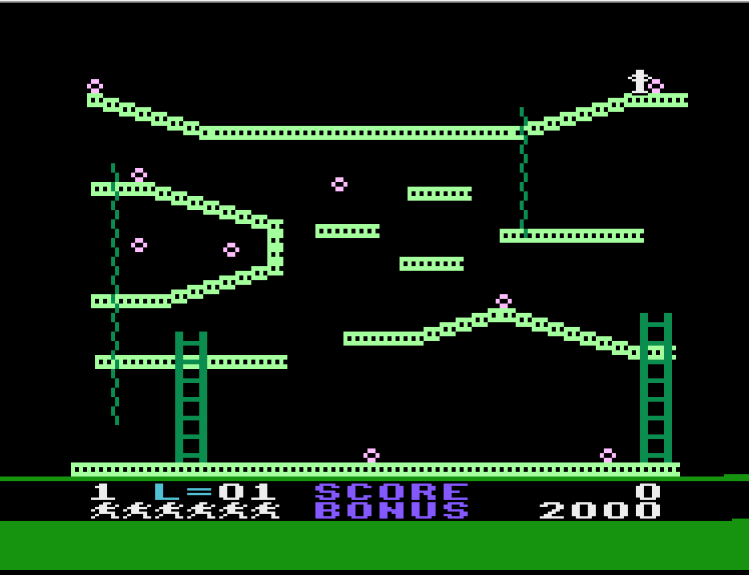 On the orginal Atari version that would be electrocution... Maybe a Multicolor Jumpman for the Custom Code version ?. Anyway this will be amazing. 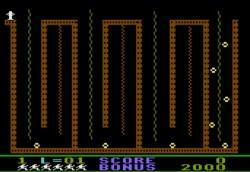 The fire level is also on the Version of Jumpman junior for the Amiga, its level 2 on beginner and it came to light last week that the best Amiga emulator Winuae would not play it properly BUT its been fixed on the very latest beta (not openly publicly released at this exact moment but if you follow Toni's beta releases you will know where to get the intermediate fix ups) and plays nicely now. Edited by Mclaneinc, Wed Jul 27, 2016 1:12 AM. Just figured it out - right clicking on the drawing window and doing bitmap zoom - good for now. I've got a fix for this; I'll put it in the next release. Thanks for the report. A few comments on the editor - In working on my level I accidentally put a peanut someplace that I didnt want - I dont see a way to remove peanuts? Also I drew a grider which I removed using the erase tool. I tried to create a down rope where I erased the girder and it wouldnt allow me to draw where I had "erased"
Is there an easy way to pick a new "bullet" shape or do you have to write code? The way to remove something is to select it using the arrow tool (it will turn light blue), then use Cut (Ctrl-X) or press the Delete key. I'll have to add a Delete option in the menu. I know I don't have a user's manual so I apologize for the confusion, but those erase icons are designed to be used in the trigger painting, not on the main level. 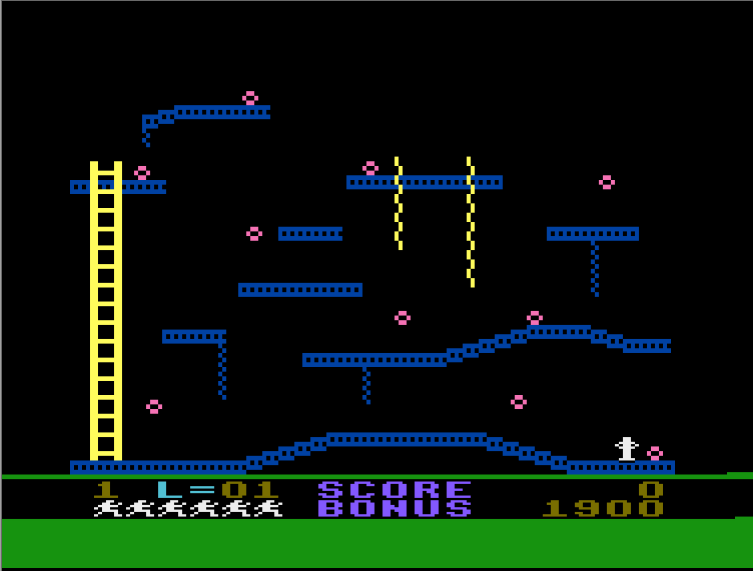 The three things, Erase Girders, Erase Ladders, Erase Ropes are drawable objects, the only difference is they draw background colored pixels. I'll have to change the toolbar so they aren't available when drawing the main level. And the effect you saw, not being able to draw where you had erased, is because Jumpman sorts the objects so that erasable objects always appear on top of drawn objects. About bullets: there's a way to make them bigger (ala Jumping Blocks), but not change their shape. They are the missiles, so they are only two bits wide. So, yeah, if you wanted different shapes you'd have to do some custom code and use a player object, or use multiple missiles or something. And BTW: your level is challenging! I still haven't completed it. How do I trigger a bullet to be a Jumping block? Is there a way to control frequency without coding? I believe some Jumpman levels have 2-3 bullets roaming around at once. Jumping blocks: custom code. Number of (regular) bullets can be controlled right from the level editor. I see the bullets - thx. Ill prob have an update to the "Jungle"
Ok. . Well. 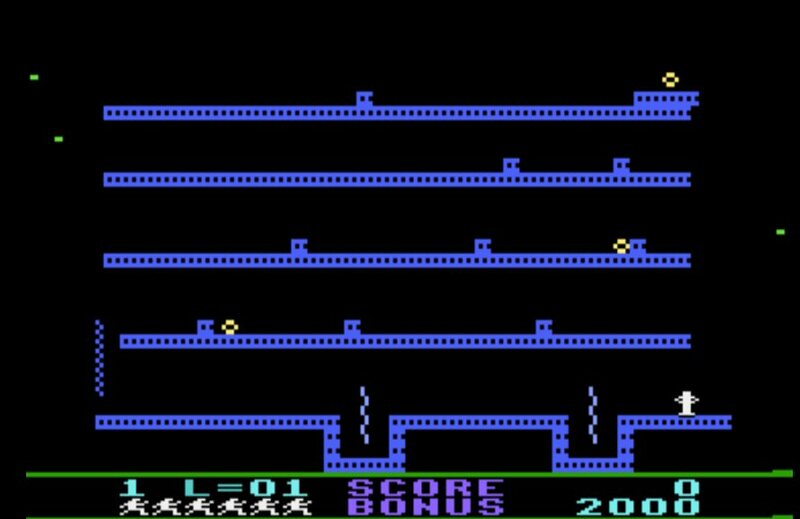 Maybe a complete Jumpman game C64 edition on the Atari should be possible, with the same levels as the C64 including the Fire Level,And with a multicolor Jumpman, looking the same as C64 Jumpman, I think that would be Cool and Fun to Have. At this point this is beyond my capabilities , Maybe someone more capabel could find this interesting ?. Edited by Grevle, Wed Jul 27, 2016 12:17 PM. Tough jump points on this one - just so I know, it appears you cant get to the bottom girder? However, I must...MUST make the following point: Pay attention to how the ropes are used in the original Jumpman levels, there is a very specific placement art to them, especially with the up-ropes, up-ropes are in reality the same color as girders (and are thus treated in the same fashion), and should traverse to be FLUSH with the girders themselves, so that you cleanly climb to the next girder (see my levels). playermissile, you do realize that omnivore may grow a mini-assembler, before it's all done...right??? The drop down pits I put in to help the player avoid the missiles. I wanted pretty tight walkways and with no ability to avoid the bullets I put a few pits in. The level layout wouldnt allow me to put them in higher up so I left them as an additional element on the first floor. Edited by Goochman, Thu Jul 28, 2016 5:26 AM.